This buttermilk chocolate cake is a new addition to my collection of cakes to drop off at dinners or leave at school functions. It’s a serve-out-of-the-pan cake that can be baked a day ahead, chilled briefly, then stored at room temperature for a day or two. In fact, the cake is even better the second day. I found this recipe years ago on Food.com and have made changes over the years. 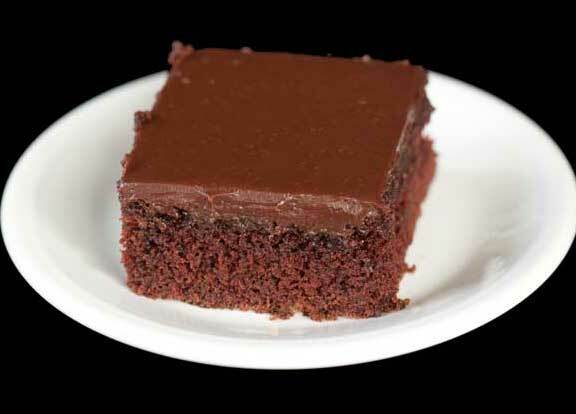 At first glance the recipe seems to be a typical Texas Sheet Cake, but it’s not. It’s baked in a 9×13 inch pan rather than the Texas Sheet Cake’s 10×15 inch, and it has a pour over icing that is rich, but not nearly as sweet. In my opinion it’s the icing that makes this cake special, but the texture and sweetness level of the cake is a perfect pairing, so I recommend using this icing with this cake before you do any mixing and matching. If you don’t trust the cake recipe or want to try a different base, the old recipe for Sue B.’s Chocolate Cake is similar and might work well, and of course Hershey’s Perfect Chocolate Cake goes with just about anything. But I recommend you give this version a shot! I thought it wouldn’t have enough of a chocolate punch, but as it happened the 1/3 cup of cocoa powder was just right. This cake is baked in an easy-to-carry-along 9x13 inch pan. It also tastes great on Day 2, which makes it the perfect make-ahead and take dessert. Preheat oven to 350 degrees. 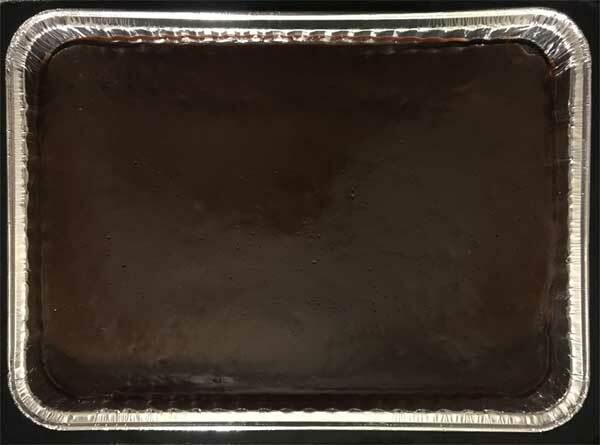 Grease a 9x13 inch baking pan. If using a disposable pan, you can skip this step. In a saucepan, melt the butter. Add the cocoa powder and stir until smooth, then stir in the water. Remove from heat and set aside. Mix together flour, sugar, salt and baking soda. Sift if necessary. In a mixing bowl or in a 2 cup glass measure, whisk together eggs, buttermilk and vanilla. Add cocoa mixture and buttermilk mixture to dry ingredients and stir until everything is well mixed, then beat 30 strokes with a big spoon or a heavy duty scraper. Pour into the pan and bake for about 30 minutes or until cake springs back when touched. Let the cake cool while you make the icing. To make the icing, melt butter in a saucepan set over low heat. Add the cocoa and whisk until smooth, then add the buttermilk and vanilla and whisk until smooth. Put the confectioners' sugar and salt (if using) in a food processor. With motor running, pour cocoa mixture through feed tube and process only until smooth. Pour this mixture over the cooled cake. Let cool down slightly, then put the whole cake in the refrigerator to help set the icing. Once the cake is chilled and set, you can take it out and store it covered at room temperature. Sifting flour isn't always necessary, but in this recipe it's a good idea to do it to help prevent lumps. You'll also need to sift the confectioners' sugar. In my experience, the icing is better when I use a food processor. However, you could probably get away with just putting the confectioners' sugar and salt in a bowl, pouring the chocolate in and mixing vigorously. Thanks for the review! I was really looking forward to hearing a review from another baker. Excellent, rich, chocolate cake. Decided to make this for Christmas dessert and everyone LOVED it. It is convenient that it can be left at room temperature when there is so much holiday food filling the refrigerator, but I do think it tastes better cold. This seems like a great cake to take on my quilting weekends. This kind of simple potluckish serve out of the pan cake is right up my alley! This looks delicious! I’m going to try this for sure . Thanks for sharing. 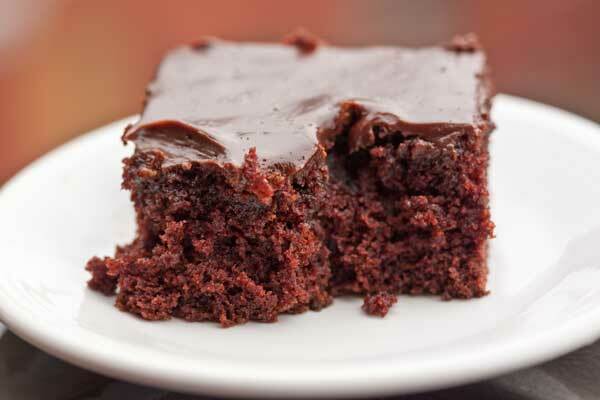 I love the type of icing where you can pour it on while warm and it settles into fudgy goodness!